Companies interested in using the RYF certification mark should read the following criteria as well as contact licensing@fsf.org to learn more about the certification process. Qualifying hardware products include: computers, components for computers, devices that contain a reprogrammable computer, and devices meant to communicate digitally with a computer. All the product software must be free software. The product software includes all software that the seller includes in the product, or provides with the product, or recommends for use in conjunction with the product, or steers users towards installation in the product. The BIOS of a PC runs on the CPU, not on a separate secondary processor, so this exception does not apply to the BIOS. By way of explanation, a general-purpose facility for installing other programs, with which the choice of programs to install comes directly from the user, is not considered to steer users toward anything in particular. However, the product suggests using the facility to install certain programs, that is steering users towards those programs. We maintain a license list that classifies common free and nonfree software licenses. It is not complete; if you are interested in a certification, we would be happy to review the licenses of your product software and advise you on whether or not they are free software licenses. Some device manufacturers include a CD-ROM with their product that has proprietary Windows drivers for the device. This is unacceptable because it does not meet the conditions above. The seller must either make those Windows drivers free software, or not include special Windows drivers. The seller must give the user, along with the product software source code, the practical capability to install replacement software for any and all of the free software in the device. This means the product must have the requisite facilities to install software in the processors that run free software, and include adequate and sufficient documentation on how to use them. If software is required for this installation, it is considered part of the product software. In addition to being free, all the product software must be buildable using 100% free software that's released to the public, on a 100% free operating system that is released to the public. In other words, a user should be able to rebuild all the product software, and replace everything on the programmable levels, using only readily available free software. The product materials must say where to get the necessary build software. If some of this build software is included in an FSF-endorsed 100%-free GNU/Linux distribution (see our list), giving the name and URL of that distribution and the program or package names needed suffices for the build software included in it. The programs needed to install and manage the product software must be released as free software. It is not required that they be capable of running on the product, but if they cannot, they should be able to run on most modern GNU/Linux systems. Please be aware that we can't check products for spy features or back doors, but if we find out about any we will drop our endorsement unless they are promptly removed. Further, because spyware or a back door may take many forms, we will need to work out precise criteria as we go along. The criteria stated below are our first attempts, and we may change them if we come across examples which they handle wrong. "Spyware" is software that transmits or makes available to anyone other than the owner any information about the owner's or the product's identity, location or activity except (1) when the owner asks to do so, (2) when inevitable due to communication protocols used, or (3) when required by law. In the case 3 applies, the product should come with prominent warning, plus a URL for where to obtain more information. A "back door" is any functionality that gives remote control over any aspect of the device operation or its software. It is normal for computers to have facilities for updating software or for letting people log in remotely. These become back doors when they are enabled by default. To prevent confusion among customers about exactly what product has been certified, any other products offered by the seller, which are not certified by the FSF, must be easily distinguishable from certified products: their names must not be similar and their packaging must also not be similar. Encumbered formats are those whose implementation is impeded by patents, interface copyrights or other restrictions. If the device supports encumbered formats, it must also support free formats that serve the same general purpose. For instance, MP3 is an encumbered format, because patent holders actively demand patent royalties from those who distribute players. Its general purpose is to serve as a lossy audio encoding format, providing a reasonable trade-off between sound quality and disk space. Ogg Vorbis is an unencumbered format and serves the same purpose. Thus, we could certify a Digital Audio Player (DAP) that plays MP3 provided it also plays Ogg Vorbis files just as well. However, while the Free Lossless Audio Codec (FLAC) is unencumbered, it does not serve the same purpose as these other formats; instead, it serves to provide lossless sound compression at the cost of much more disk space. Thus, FLAC does not satisfy the criterion to make MP3 support acceptable, and we cannot certify a DAP that only supports MP3 and FLAC files. The device may support formats that are hampered by Digital Restrictions Management (DRM), but it can only use free software to do so. Any software patents the seller owns, that cover any aspect of the product software or its operation, must be licensed to all users who receive copies of any version of the software, in a way consistent with use and redistribution of that software as free software under the free software licenses that it carries. Likewise for any patents that the company has obtained licenses to use in the product software. Any generally useful technical documentation about the product, such as user or developer manuals, must be released under a free license. 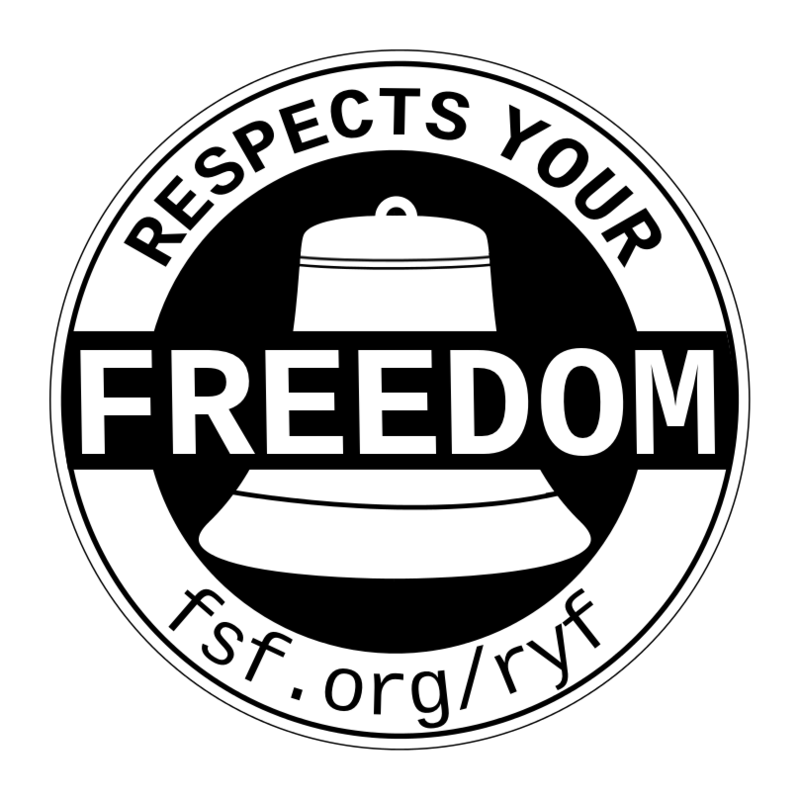 Companies awarded RYF certification for a given product, must not distribute any product-related materials with endorsements or badges to proprietary software, such as "Works with Windows" or "Made for Mac" badges, because these would give an appearance of legitimacy to those proprietary packages, and may make users think the product requires them. However, we don't object to clear factual statements informing the user that the product also works with specific proprietary operating systems. The seller must use FSF approved terminology for the FSF's activities and work, in all statements and publications relating to the product. This includes product packaging, and manuals, web pages, marketing materials, and interviews about the product. Specifically, the seller must use the term "GNU/Linux" for any reference to an entire operating system which includes GNU and Linux, not "Linux" or "Linux-based system" or "a system with the Linux kernel" or any other term that mentions "Linux" without "GNU". Likewise, the seller must talk about "free software" more prominently than "open source." The FSF and the seller will jointly set up a bounty program to encourage the public to report any failure to follow these conditions, with a view to correcting the failures. In this program the FSF will give a small reward to the first person to report any compliance problem in the product previously unknown to the FSF. The FSF will forward the reports to the seller. Failing to meet these requirements at any point can result in immediate revocation of certification. However, if the failure was unintentional we will look for a way to resolve the problem amicably by bringing the product into compliance with these terms. A product bearing the Respects Your Freedom certification mark tells customers that your product respects their freedom: the user can change the device as much as you can, and they can do it with free software, and they'll be able to do all this without fear of running afoul of your patents or similar legal threats. Backed by the FSF's rock-solid commitment to software freedom and users' rights, our promotion of your certified product tells the world that this is a product they can trust completely to work for them.